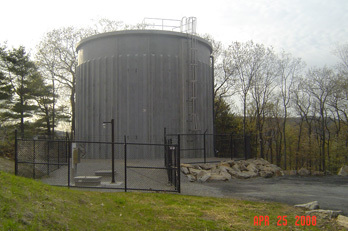 Title : Stoney Lonesome Water Supply Tank, USMA, West Point, N.Y. 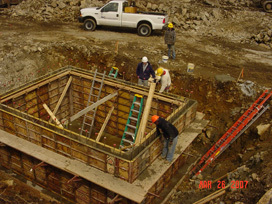 Constructed new pre-cast concrete 250,000 gallon water storage tank. 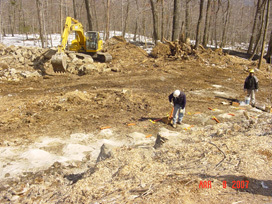 Work included site clearing, rock blasting, cast in place 12 'x 8' x 24' concrete valve vault, 12'' water main wet tap , 12'' water wet tap main to new tank, gate valves, check valve, altitude valve, 6'' drain line , interior/exterior lighting, lightning protection, fencing, backfilling, and drive way. 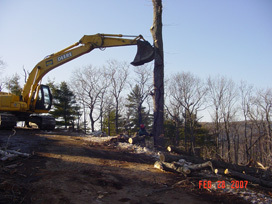 Site clearing, tree removal, etc. 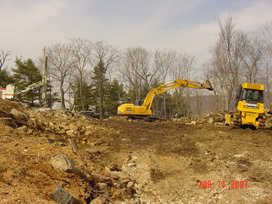 Site clearing and rock removal. 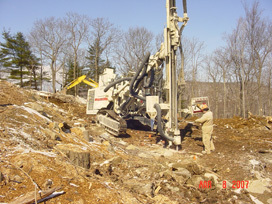 Drilling for blasting rock in work area. 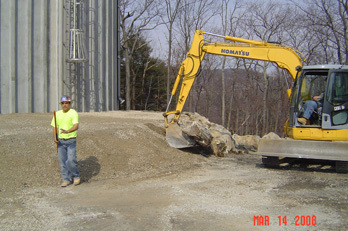 Explosives being placed in drilled holes in tank pad area. 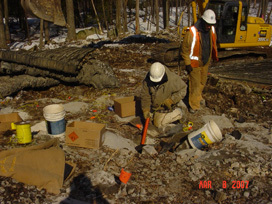 Explosives being placed in drilled holes for water main trench and valve vault. 12'' wet tap on existing water main to feed new water tank. 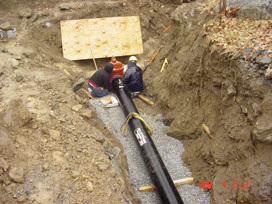 New 12'' water main starting at wet tap on existing main. New underground cast in place valve vault form work. 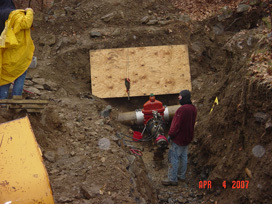 Placing valves and piping in new valve vault. 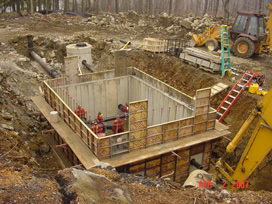 Completed valve vault with piping to new tank. 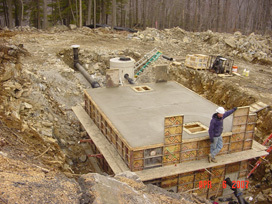 13'' base slab being poured for new tank. 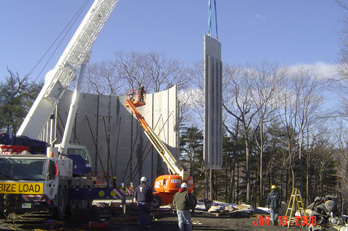 Precast wall panels being installed for new tank. 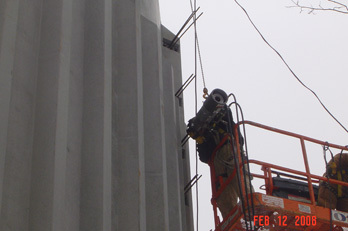 Tension cables being pulled into position in conduits in wall panels. 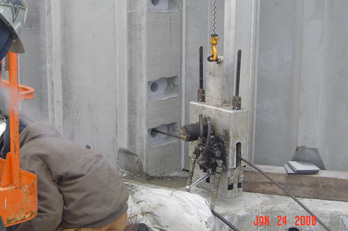 Cables being tensioned in wall panels. Roof panels being set in place. 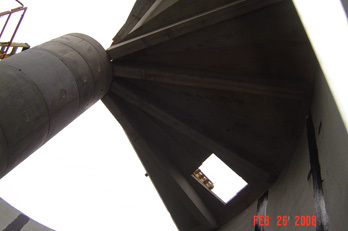 Roof panels set on inner column and outer walls. 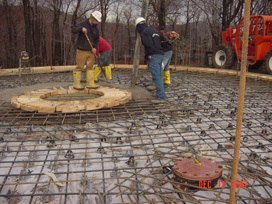 Backfilling around tank 3' above base slab for frost protection. 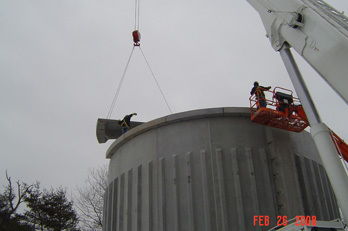 Completed 250,000 gallon water storage tank.